This page is a “one-stop” locale to read the on-going bulletin series on the life of St. Francis of Assisi. The purpose of the series is to introduce the “real ” Francis to parishioner. And perhaps you wonder why we speak of the “real” St Francis? Did you know that statues of St Francis are the second most popular lawn/garden ornament sold every year – right behind pink flamingos. Rather like the popular icon shown above. That is an image many people have of St Francis, certainly one reinforced by Franco Zefferelli’s film Brother Sun, Sister Moon, another in a long line of romantic interpretations of the poor man from Assisi. Especially in the 20th century, Francis was portrayed as “a free spirit, a wild religious genius, a kind of medieval hippie, misunderstood and then exploited by the ‘medieval Church.’ Or perhaps they know him as the man who spoke to animals, a nature mystic, an ecologist, a pacifist, a feminist, a ‘voice for our time.’ For others he is the little plaster man in the birdbath, the most charming and nonthreatening of Catholic saints…. 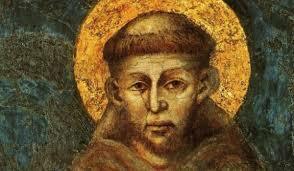 almost everyone has his or her own Francis” (Francis of Assisi, Augustine Thompson OP). Enjoy the series.